BDCW ULTIMATE Skid Plates continue to be the top choice of expert riders, proving their worth in the most rigorous conditions and terrain, worldwide. Think you don’t need this much protection? Think again. It’s while learning to master big bike skills, both on pavement and off road, that the carnage happens. Rocks get kicked up, bikes get dropped and hung up, curbs get in the way, and scrapes and spills are just part of the adventure. And, the ULTIMATE Skid Plate is designed to take all of this abuse—and more. 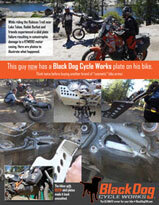 ENGINE GUARDS—The installation of our skid plate requires the stock KTM crash bars. Does not work with other aftermarket crash bars. HEADER PIPES—Not compatible with Remus header pipes. Here at Black Dog Cycle Works we try not to “rest on our laurels,” so when KTM released the new 1090R and 1290R with increased off-road capabilities, we decided to take another hard look at our skid plate for the 1090/1190/1290 models to determine if improvements were necessary. And we did—with the ULTIMATE Skid Plate 3.0 and integrated Side Stand Relocator! While maintaining maximum protection of critical engine components we were able to refine the design to create a sleek lower profile with increased ground clearance, improved airflow and reduced weight. The number-one priority from the beginning was to relocate the vulnerable side stand OFF the ENGINE CASE! Given our first-hand experience with the 950/990 side stand design, we were baffled when the newer KTM for the side stand design on the 1190/1290 was actually MORE susceptible to engine damage than the 950/990 models. Our comprehensive skid plate design is actually two products in one—a rugged skid plate PLUS a patented side stand relocation kit. 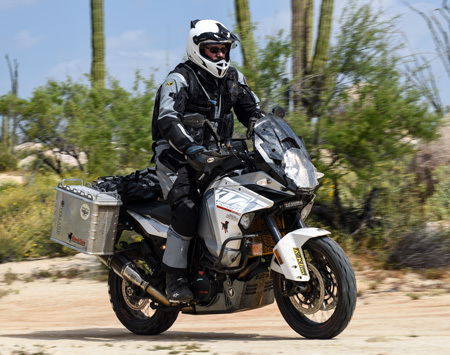 Some may tell you that removing the side stand off the engine is “not necessary” because their skid plate “provides coverage.” If you are willing to gamble on a potential $8,000.00 repair bill, or getting stranded in the back country, that decision is entirely up to you. Here's what satisfied BDCW customers and industry editors and experts are saying. The shopping cart is not able to calculate the correct shipping cost for Next Day, Second Day or Three Day UPS shipping due to the size of the skid plates. We will adjust the actually shipping cost once it has been determined. If you prefer, you are welcome to contact us for an expedited shipping quote.